OXFORD, Miss. 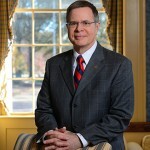 – Jeffrey S. Vitter, the 17th chancellor of the University of Mississippi and distinguished professor of computer and information science, will be inducted into the National Academy of Inventors this week in Houston. Vitter was among 148 inventors named a 2018 fellow by the NAI, which recognizes and encourages inventors with patents issued from the U.S. Patent and Trademark Office. He is one of 13 chosen from the SEC. The induction will take place April 10-11 during the Eighth NAI Annual Meeting. The organization’s mission is to enhance the visibility of academic technology and innovation and translate the inventions of its members to benefit society. The 2018 NAI class, which has made a notable impact in a variety of fields, represents 125 research universities and governmental and nonprofit research institutes worldwide. The inductees are named inventors on nearly 4,000 issued U.S. patents. More than 1,000 NAI fellows have generated over 11,000 licensed technologies and companies, created more than 1.4 million jobs and generated some $190 billion in revenue. Vitter’s time in higher education spans more than 38 years at Brown, Duke, Purdue and Texas A&M universities and the University of Kansas. He is a computer scientist with research expertise in big data and data science, especially the algorithmic aspects of processing, compressing and communicating massive amounts of information. He is a fellow of the Guggenheim Foundation, AAAS, ACM and IEEE, and is an NSF Presidential Young Investigator, Fulbright Scholar and IBM Faculty Development Awardee. Vitter has more than 300 publications and has delivered more than 200 invited presentations worldwide. His Google Scholar h-index is in the 70s, and he is an ISI highly cited researcher. In research, Vitter is perhaps best known as a leader in the field of external memory algorithms, which focuses upon reducing the input/output communication bottleneck between fast internal memory and slow external storage – such as disk or the cloud – which is important for a variety of data-intensive applications. He co-holds five patents on optimizing input/output throughput, approximate data structures, online predictors for machine learning and external sorting. He also has been a champion of entrepreneurship and technology commercialization in his administrative roles.